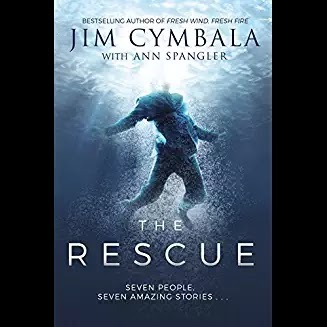 By New York Times bestselling author and pastor Jim Cymbala, The Rescue tells the powerful, true stories of men and women whose lives should have ended badly but miraculously didn't. Something unexpected happens to each of them and their incredible stories will take you by surprise and restore your hope. Well, Jim Cymbala and Ann Spangler may not have witnessed a miraculous pregnancy, but they have seen God work miraculously in the lives of seven people. They saw God working so powerfully, that they just had to write a book about it. They called this book . . .
Short. Sweet. And definitely to the point. There is no other word for it . . . these individuals were rescued from circumstances that defy the imagination. And they share their stories to remind you that God is still in the life-saving business . . . and that there really is nothing too hard for God. The stories are written in the first person, and the “writers” don’t pull any punches. They are brutally – sometimes graphically – honest with their experiences, so you might want to keep that in mind when considering younger readers. And for those who have been technologically blessed (which is about everyone these days!) you can watch 5 of the stories contained in the book online at www.TheRescue.nyc/watch. Think you’ve strayed too far from God to be rescued? These seven testimonies just might change your mind. 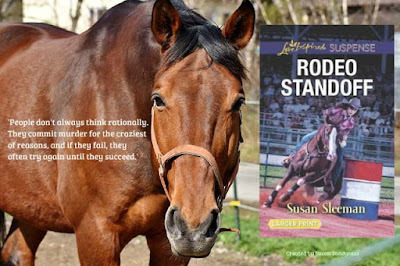 5 stars for a testimonial to the rescuing power of the one true God. The rodeo arena is always treacherous. 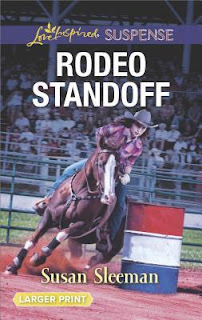 It’s no accident Deputy Tessa McKade is trapped with an angry bull ready to trample her to death. She quickly realizes that McKade Law is no longer enough to keep her safe—and it’s her rescuer, Braden Hayes, who stands in as her bodyguard. As they seek to stop a would-be killer, Braden will have to use all his professional skills to guard Tessa’s life. My thoughts: RODEO STANDOFF is Ms. Sleeman's newest romantic suspense. 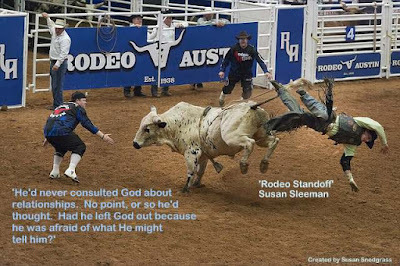 And who expects it to start with her trying to stand-down an angry bull that appears out of nowhere? Or a hot cowboy who shows up in the nick of time to save her life? But it soon becomes apparent that someone is serious in there attempts to kill Tessa McKade--but why? And who? Ms. Sleeman did a good job of catching the aura and persona of rodeo champions and I could almost smell the dust and hear the screams of the crowd as the cowboy fought to stay on top of a bucking bull for six seconds (or longer) .... fighting for the championship. I was given a copy free. All opinions are my own. Feel comforted and at peace when you read these uplifting romances of faith, forgiveness and hope from Love Inspired. There are 12 new books each month! 6 from Love Inspired for those who love contemporary romance and 6 from Love Inspired Suspense who like some danger with their romance stories. After inheriting a crumbling lighthouse, Dr. Ben Garrison is more than ready to get rid of it until he meets a determined Marci Weber who wants to save the landmark. Can she make him see her point of view? In the midst of life's storms, unexpected love is a beacon of hope. A crumbling lighthouse is not part of the inheritance Army doctor Ben Garrison expects to claim when he journeys to Hope Harbor. Fresh out of the service, he wants only to unload the tower of bricks, decompress from years of treating battlefield trauma, and prepare to launch his civilian career. Hope Harbor Herald editor Marci Weber has other ideas. She may not be a Hope Harbor native, but the small Oregon seaside town has become home--and she's determined to save the Pelican Point landmark. Sparks fly as the two go head to head over the fate of the lighthouse. But when they start to cooperate, a different kind of fire ignites. And as they work together, might Hope Harbor heal the hearts of these two romance-wary souls? Bestselling author Irene Hannon invites readers back to their favorite town for a story that will light a beacon of hope within their hearts. 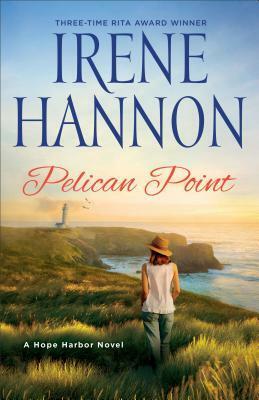 My thoughts: PELICAN POINT is the fourth book in Ms. Hannon's Hope Harbor series, but it easily stands alone. This book features two relatively newcomers to Hope Harbor, one Army surgeon who came to settle his grandfather's estate and a newspaper editor who tends to get a little emotional. In Ms. Hannon's stellar storytelling, I was instantly drawn into the story, in love with both Marcy and Ben, not to mention the secondary characters I've grown to love in the previous stories: the two feuding--but best friends--ministers, Charlie the fish taco guy, Floyd and his "wife", as well as new to the scene Rachel and her husband Greg. Heart-thumping romance, a stalker (though nothing near Hannon's suspense), secrets, and a save the lighthouse campaign are enough to keep the pages turning, and for this book to go on my keeper shelf. I *love* this series! Hannon is one of my favorite romantic suspense authors and also one of my favorite contemporary romance authors. I can't wait for my next visit to Hope Harbor--in Spring 2019. 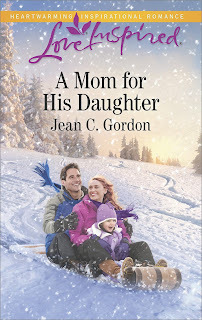 My thoughts: A MOM FOR HIS DAUGHTER is Ms. Gordon's most recent book. I finally obtained a copy, and enjoyed getting to know Marc and Fiona. 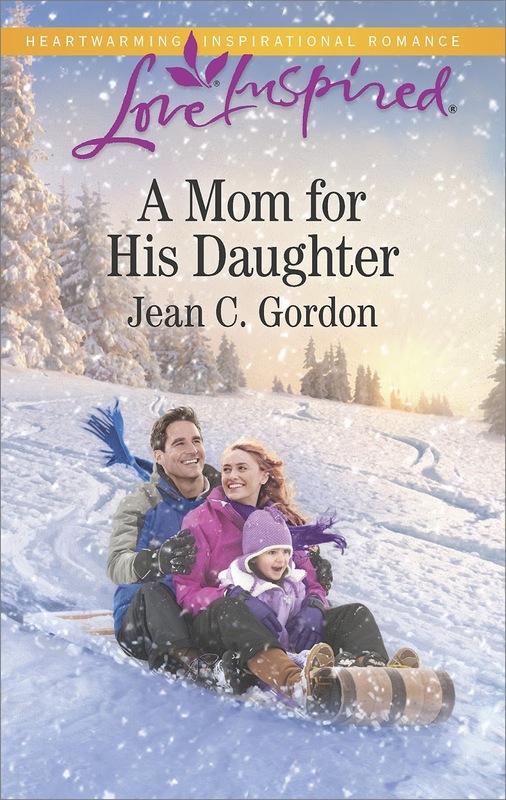 The story was sweet, set in the cold, snowy, New York winter, and involved winter activities such as sledding. Stella, the daughter, seems a bit bossy, but she is three and some preschoolers are. Marc is a work-aholic, and Fiona is living out her baby sister's life--and death--in Stella. I was a bit surprised Marc's whole family took Fiona in as family, but it was sweet. It was more wife like than sister of the birthmom like. I can't explain that real well. Anyway, an adorable wintery story for days that are too hot to handle (to cool you off) or to curl up with in front of a fire on a cold wintery day. I enjoyed it. 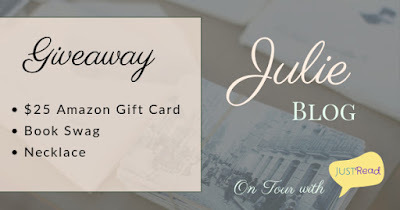 Welcome to this stop on the Julie by Catherine Marshall Reissue Celebration Blog Tour with JustRead Publicity Tours! as they investigate the conditions of the immigrant laborers. As the Alderton Sentinel and Julie take on a more aggressive role to reform these conditions, seething tensions come to a head. When a devastating tragedy follows a shocking revelation, Julie’s courage and strength are tested. Will truth and justice win, or will Julie lose everything she holds dear? My thoughts: I read JULIE years and years ago, when it first came out, as my aunt had a copy, and I didn't like it then as well as I liked Christy. I was wild about Christy. This, like Christy, is loosely based on Ms. Marshall's real life, as it is, as the introduction says, her story, fictionalized. The story starts off exciting, with the family miraculously saved from a flash flood. But from there it sort of drags. I am not a big fan of depression era stories, and I wasn't alive during the flooding or any of the events, and I'm sure readers who love depression era or more "modern" historical stories would love it. I requested a copy to review because I did love Christy so, and I wanted to give JULIE another chance. It still didn't grab me. I wanted to like it, and I did like parts of it. The British guy was a nice touch. And I cried with some of the events at the end of the book. 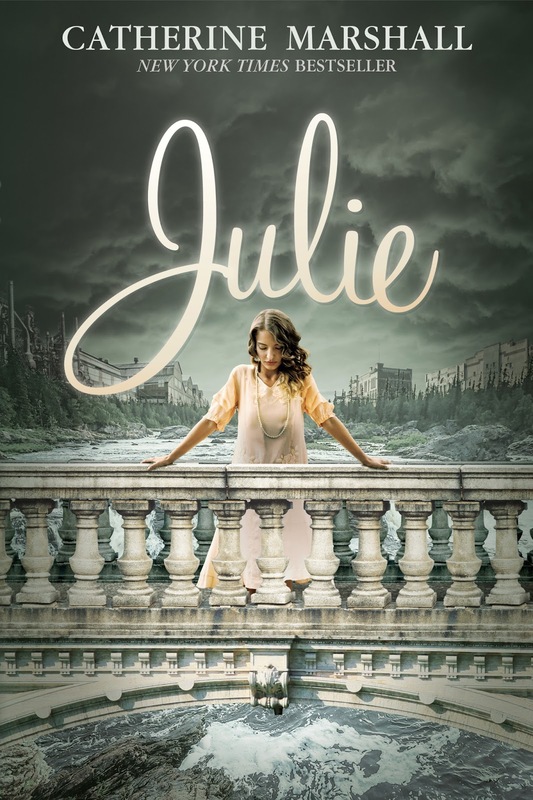 If you like based-on-real-life stories or depression era stories, you might love JULIE. Catherine Marshall (1914-1983), “The New York Times” best-selling author of 30 books, is best known for her novel “Christy.” Based on the life of her mother, “Christy” captured the hearts of millions and became a popular CBS television series. Around the kitchen table at Evergreen Farm, as her mother reminisced, Catherine probed for details and insights into the rugged lives of these Appalachian highlanders. Catherine shared the story of her husband, Dr. Peter Marshall, Chaplain of the United States Senate, in “A Man Called Peter.” A decade after Dr. Marshall’s untimely death, Catherine married Leonard LeSourd, Executive Editor of “Guideposts,” forging a dynamic writer-editor partnership. A beloved inspirational writer and speaker, Catherine’s enduring career spanned four decades and reached over 30 million readers.